Vimtutor Interactive tutorial inside Vim to get you started. Vim Help The internal Vim help, also available off line in your Vim via :help. It’s a good idea to read it once. At least the TOC to know what’s there to check it out as soon as you need it. Book Practical Vim I definitely recommend reading this book as it walks you through most use cases without being bloated. Even if you just think about switching to Vim, get this book and look up if it’s worth to switch. VimAwesome A collection of Vim plugins with grouping by topics and search. Of course you can train the shortcuts on the page by using J an K and such. If you are looking for a feature that vim doesn’t offer, just search there. Tip: If you enter the page, plugins are sorted by popularity, so you wanna check out the top most plugins to get an idea what plugins can do for you. Vim Text Objects: The Definitive Guide Introduction into textobjects which are one of the defacto reasons to use Vim over other editors. Vimcasts Very short screencasts for Vim, each dedicated to one small topic. So you can check out what you need, and learn one by one. 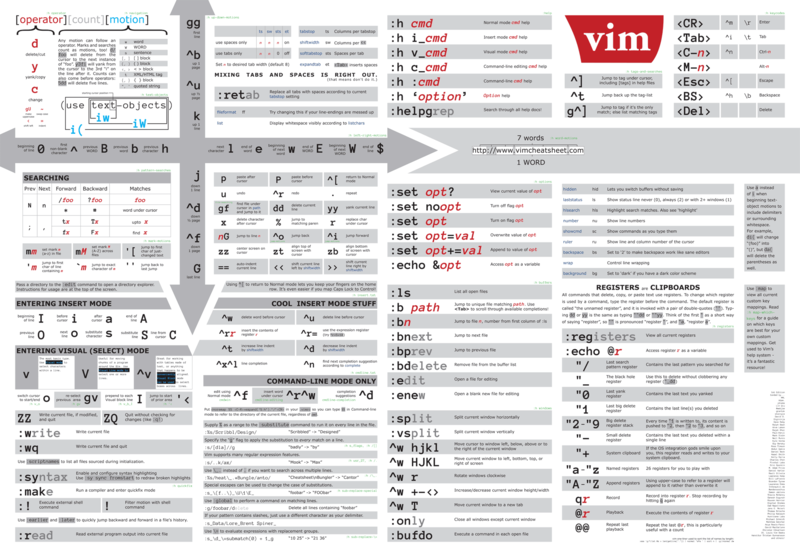 Learn Vimscript the Hard Way If you want a guided tour follow this one. It’s a nice addition, and free in the www. In my opinion it’s not as easy for beginners as the book above. But to get even deeper, it’s the next level after the book. It also covers some more topics then the book does. The following links are from my bookmarks and I can’t remember them, so the list is unordered and you have to take a look whether they are great or not. And of course I can’t describe them. Last but not least, practice and adjust, google if you need and read blog posts like the following. And of course a good cheatsheet will help you all the time. If you know more resources that should be mentioned here, just contact with me by one of the ways you can find in footer.